Diary of My Witness of God’s Love and Mercy during my Dad’s Last Days of Life. By Donald Andre Bruneau, his 3rd son. I arrived at the Leacock Care Centre at 9:15 p.m. to spend time with my Dad ‘Hector Joseph Philippe Bruneau’. Dad was very happy to see me. I spent 1.5 hours with him and later went to sleep on the sofa in the family room close by. I discussed ‘dying’ with Dad, telling him that if he is ready to go to God, to do so, he has our permission. He can go join his parents, Philip and Eda Bruneau. I told him we will all miss him, but we will never forget him, and we love him. I told Dad the most important thing for him to remember was that God loves him so much and I quoted him John 3:16: “For God so loved the world that He gave his only begotten Son, so that whosoever believer in Him may not perish but have everlasting life. I also told Dad that he was dearly loved by all his family. Dad said to me this morning: “My son.” He repeated this again to the nurse, while pointing at me and saying to her…”my Son. I was deeply touched by this. Jerry came to see me. He took me for lunch and we went to see the funeral director afterwards. 3 p.m….when I entered Dad’s room he called out loud and clear… “Donald”. Dad drank a lot of water today. Once he yelled out..”Water! Water!” It reminded me of Jesus’s cry on the Cross…”I thirst”. Nurse Elizabeth also told me how clear Dad’s mind was! And how peaceful Dad is. When you consider that Dad had ALZEIMERS…a clear mind is a gift and grace from Heaven! Dad has lost so much weight, it is amazing that he is still alive. He has been living on water only for the last 2 to 3 months. He went down from a healthy 170 lbs to about 70 lbs (very thin, bonny frame). God has a reason for keeping him alive. I told him to ‘let go’s when he is ready to go, that Jesus and Mary are waiting for him. He is not alone. I told him that we are praying for him. This morning nurses put dressings on his back shoulder blades which are now open sores from lying on his back all the time. Dad cried out in pain. I got up, held his hand and prayed the ‘Chaplet of Divine Mercy and told Dad he can surrender to Jesus and Mary. He closed his eyes and slept very peacefully. One of the PSWs, Katy, the tall blond who called Dad ‘Turkey’ said that she and another PSW were with Dad last week, washing him. “Everything is forgiven, everything is under the Blood of Jesus. We all love you, your four boys and Mom. We respect you and are proud to have you as a father. You worked hard for us. I am proud to have you as my father and I would not have it any other way. After I said all of this to Dad, Dad who was looking at me all the time, nodded his head and eyes to affirm…”yes”. 3:10 p.m. Mass celebrated for Dad. – the Grace to have a good and peaceful death. Fr. Valerien promised me to celebrate mass for Dad that day at 6 p.m sharp. God is so good! I told Dad about the Mass and that I was going to call his young sister Sister Teresa Bruneau of the Sisters of the Presentation. I asked Dad if he had anything to tell her. Dad had tears and I believe I heard him say: “I suffer too much!” while pointing to his body. I also told Dad that at 6 p.m. my friend, Fr. Valerien will celebrate Mass for him. I then immediately called Auntie Sister Teresa to explain to her about the Mass and give her Dad’s message. Auntie asked me to tell Dad: “Hector, you have always been good to me. I love you very much Hector. God grants you His forgiveness. The Mercy of God is infinite. I returned to Dad and gave him Sister Teresa’s message. I encouraged Dad to turn to Jesus during the Mass and if he wished to let God come and get him. I told Dad that someday we will be re-united in Heaven, with a glorified body and where there is NO more suffering and LOVE prevails. I read Psalm 91 to Dad. I also prayed a Prayer of Deliverance over Dad. I then made the Sign of the Cross over his forehead (out loud) with Holy water. I prayed the Joyfull Mysteries of the Holy Rosary out loud for Dad. 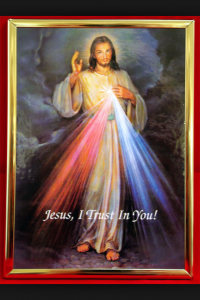 I prayed the Chaplet of Divine Mercy out loud for Dad. I took my Mass missalette and read the words of the Mass out loud so Dad could hear it all. I told Dad that right now Fr. Valerien is celebrating the Holy Sacrifice of the Mass in Ottawa just for him and that his sister Teresa is joining us in prayer for him also. I also put the photo and relic of Saint Padre Pio on Dad’s pillow during the Mass. When I told Dad his sister Teresa was joining us in prayer, he took his right hand (as feeble as he was) and looked at me with a big smile and a special joy in his eyes and made the “O” OKAY sign by making an “O” with his thumb and index finger. This was a sight that I will never forget! Dad was so happy and so grateful. Heather…came to say bye to Dad a few days before he died. Leanne…she requested the Sacrament of the Sick for Dad. Altea, the PSW who assisted Dad from 3 a.m. to 5 a.m. while he was breathing his last on March 17th, 2003. God bless her soul. Dad is quiet, awake often during the night. I slept in his room on the lazy-boy chair so he would not be alone. Heather came in to see Dad at the end of her shift to say goodbye; she gave Dad a kiss on the forehead, had tears. The ladies working there truly love the residents they take care of. I met with Peter, a representative of the Canadian Legion’s ‘Last Post Fund’ this morning. I shared the Divine Mercy Devotion and the question of suffering with ‘Harriette’ (widow) the daughter of a resident. Dad drank about 4-5 glasses of water so far today. A quiet day with Dad. Today I was reading from Reader’s Digest, January, 2003…”Answering A Call to Love Interview with Jean Vanier. What do people desire? What are people longing to hear? Vanier: “People are longing to hear that there is ‘hope’s. Human beings can ‘change’. There is something incredibly beautiful in every human being. People are looking for a place to find ‘Faith, Hope and Love’. Je veut de l’eau benite! So I went up to Dad and took some Holy water and made the Sign of the Cross on his forehead and prayed asking God to grant Dad peace and Joy and then I prayed a French prayer to ‘Notre Dame des Pauvres’ for Dad. Je me jette avec confiance dans le sein de votre Misericorde. Dad rested peacefully. I spoke with Dr. Brand. He said a ‘morphine patch is available if Dad experiences pain, and by needle also. He said one 90 year old lady went for three weeks without food or water before she died. I was away from Dad’s bed for a while. Dad said to a blond PSW, Kari: “Where’s my Donald?” He missed my presence in his room. All the residents were coming down with a bad flue and last night I could feel myself getting nausea and sick so I decided to go home today for the weekend and return next week to be with Dad. Just before I left Dad, I went to the side of his bed. I took his right hand into mine and said: “Dad, listen to me very carefully. I am sick with the flue. I am leaving for a few days for Timmins. I will miss you. I have been here a week with you. If you feel God is calling you ‘Home’, let go towards Him. Dad, you are forgiven. You are loved by God, by me and your whole family. Thank you Dad for having been a very good father. I will keep praying for you. Bye. I was tempted to take a photo of Dad, but he is so skinny, I felt I owed him the respect of not photographing him in that state. The Bible states that we come “from dust and will return to dust”. So TRUE. How many people forget this. It was a great gift and grace given to Dad to die a slow death and have time to prepare his soul to meet his Creator. As I left I asked myself, almost in tears, will I get to speak to Dad again? It has been such a great blessing to be with Dad for a whole week, care for him, especially in the spiritual realm. Thank you Lord. She said that Dad smiled and acknowledged what she said for me. March 17th, Monday…at 5 A.m. Shortly after 5 a.m. I got a phone call from Leacock Care Centre. It was ‘Althea’, one of the PSWs. She informed me that Dad had just passed away. She said that when she checked on Dad at 3 a.m. she observed that his breathing was less and less frequent. She arranged to be with him. I will never forget the moment Mom said this. It was an interesting observation that she had made of the man she had loved and married. Thank you Dad for everything you did for love of us, especially the gift of LIFE. March 19th, 20th…Dad is laid to rest. On March 19th, 2003 the Bruneau family all convened in Chelmsford , Ontario, where Dad spent several of his final years of life.